The world's best dart players will return to the Citywest Hotel Convention Centre for the World Grand Prix Darts Championship on the 8th to the 14th of October. The Championship will be held at the Citywest Hotel Convention Centre and it will be screened on sky sports. The Partypoker.com World Grand Prix sees 32 top players face off at Dublin's Citywest Hotel in one of the most exciting and unpredictable events in darts. This is one event that you don't want to miss, one minute you will be sitting on the edge of your seat with nerves in silence and next you will be up celebrating and supporting the players. Phil "The Power" Taylor who won the championship last year for the 10th time, will be there to defend the title along with some of the best players in the world. The 2011 tournament saw history made as Brendan Dolan became the first player to hit a double start nine dart finish during his run to the final, where he lost to Phil Taylor. 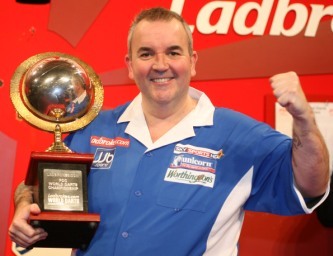 You can guess who the bookmakers favourite is - Phil Taylor at 1/19. Tickets are available from the Citywest Hotel Box Office on +959 1 401 0505 or Click Here to buy tickets online. Bewley's Hotel Newlands Cross have some great rates available, rooms starting from €59 per night, stay 2 nights and get 10% off. Bewley's Hotel Leopardstown have some great rates available, rooms starting from €69 per night, stay 2 nights and get 10% off.